It’s the moment every IT department dreads: A data loss event takes your business offline and the countdown clock begins. Despite spending countless hours safeguarding against and preparing for this moment, the impact of downtime is immediate and all-consuming. 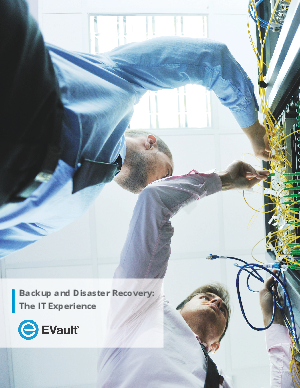 understand the IT experience during a data disaster, EVault commissioned Spiceworks Voice of IT to survey IT pros regarding disaster recovery practices and perceptions. All survey respondents were based in the U.S. and have influence over backup/disaster recovery purchase decisions. This e-book will explore the impact of downtime and data loss on IT departments for small and midsize businesses.